On Saturday, November 17th, Natalie Davis, from Dowagiac received the honor of representing her community as the 2019 Miss Heart in front a full house at St. Joseph High School. The Miss Heart Pageant originated in 1992 offering young women living in communities that do no host a hometown pageant the opportunity to compete for the title of Miss Blossomtime. Some of these communities are, Allegan, Decatur, Dowagiac, Paw Paw, Covert, Fennville, Lawton, Mattawan, Marcellus, Three Rivers, Vicksburg and surrounding communities in Southwest Michigan. As Miss Heart, she will join her sister queens competing for over $20,000 in Scholarships in the Miss /Mr. Blossomtime Pageants. The 2019 pageants will be held on March 10th and 11th at Lake Michigan College, Mendel Center. This year’s winner Natalie Davis is currently enrolled at Southwestern Michigan College where she is working toward her nursing degree. She plans to transfer to a university to finish her nursing degree and become a neonatal nurse. Natalie was All-Conference Honorable Mention for volleyball 10th-12th grade years in high school and graduated with honors. Natalie is the daughter of Wendy and Jim Davis of Dowagiac, MI. Earning the title of 1st Runner-Up and Miss Congeniality is Jessica Schoff from Dowagiac. Jessica is currently enrolled at Southwestern Michigan College where she plans to get certified in phlebotomy then work her way up to being an Anesthesiologist. Jessica has awards from competitive cheer, soccer and softball. She has two Bravo awards from 4-H along with Best of Show and a 3rd place on her Market Duck. Jessica is the daughter of Sheri and Paul Schoff of Dowagiac, MI. Earning the title of 2nd Runner-Up is Makaela Castaneda from Dowagiac. Makaela is currently enrolled at Lake Michigan College and Southwestern Michigan College and plans to get her associate degree in medical assisting and hopes to be able to internship at Southwestern Medical Clinic. She was a 2-year MVP for cheerleading, second team all-conference award and Honorable Mention all-district award and a 1st place cheer award. She received her 10-year award in 4-H and had a Reserve Champion Mini-lop. Mikaela is the daughter of Kamoka and Guadalupe Castaneda of Dowagiac, MI. Earning a finalist title to Miss Heart is Alanna Smith from Dowagiac. After high school, Alanna plans to attend Southwestern Michigan College to obtain her degree in Elementary Education and then transfer to Ferris State. Upon completing this degree, she plans to go to Indiana Bible College to obtain a bachelor’s degree in Worship Ministries. She would also like to continue to help promote literacy with the First Books for Kids St. Joseph County reading team and help her mom start a group in Michigan. Alanna is the daughter of Tearsa and Robert Smith of Dowagiac, MI. Also, competing for the title of Miss Teen Blossomtime that evening were 10 contestants ranging in ages from 13 to 15. 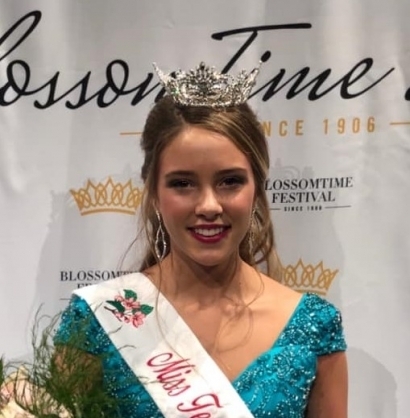 Crowned Miss Teen Blossomtime 2019 was Paige Albright. Paige attends Edwardsburg High School and after high school, would like to be an orthodontist. She plans to attend Michigan State University and then enter dental school to apply to an orthodontics specialty program. Paige has earned the Academic Excellence Award 2018 (it is the highest academic award granted by Edwardsburg High School) and served on the Ronald McDonald House Teen Board 2015-1016. She is currently on the Varsity Girls Basketball team, plays AAU travel basketball, tennis and swimming. She is the daughter of Reegan and Philip Albright of Niles, MI. 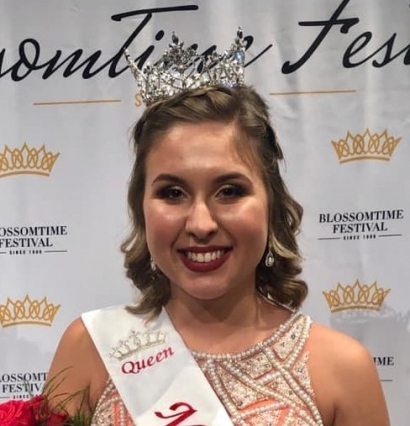 Crowned 1st Runner Up to Miss Teen Blossomtime 2019 was Madison Jackson, daughter of Eric and Tiffany Jackson. Crowned 2nd Runner Up was Hailey Drew, daughter of Courtney Granzow of St. Joseph and James Drew of Bridgman, MI. Crowned Miss Congeniality was Claire Caplea, daughter of Kim and Casey Caplea of Stevensville, MI. Tying into the 2019 Festival theme “America, the Places You’ll Go” the pageant theme was “Arizona, The Grand Canyon State”. The chairman of Miss Heart is Thalia Bertuca and the chairman for Miss Teen Blossomtime is Michelle Ellis. Zack East emceed the pageant.